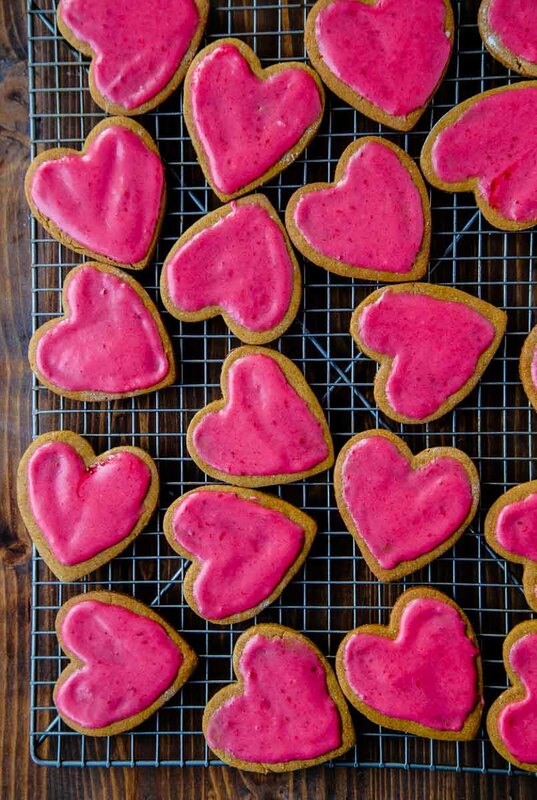 Gingerbread Cut Out Cookies with fresh ginger, orange zest, and a hot pink fresh cranberry glaze. 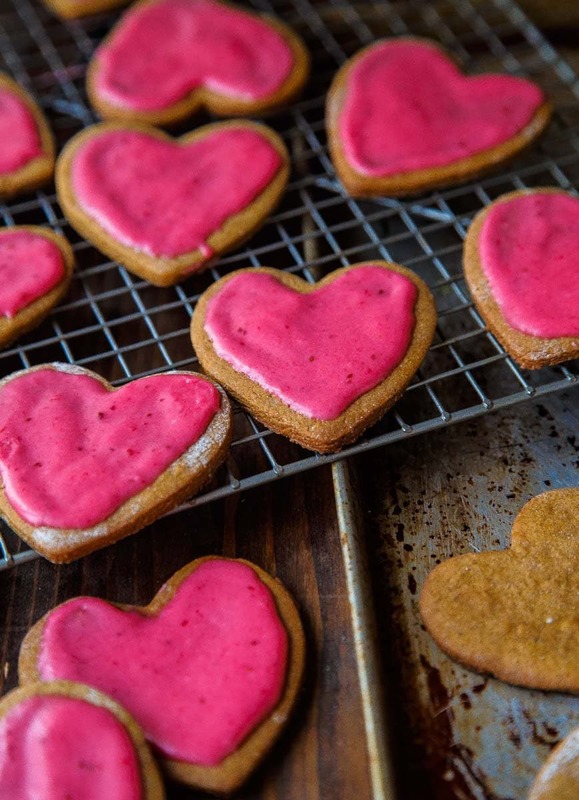 Hey there–I first shared these adorable hot pink heart cookies last holiday season, but I’ve been wanting to share them again because I think they’re perfect for Valentine’s Day. I just can’t resist a pink cookie. Enjoy! Well, this is a bit awkward. Is it Christmas or Valentine’s Day around these parts? I think these orange-spiced gingerbread cut out cookies with cranberry glaze scream Christmas cookies. I would even argue that orange-spiced gingerbread needs to be the next holiday candle scent. But, then when you look at these babes, your mind leaps to Valentine’s Day. Hot pink hearts? Yeah, Single’s Awareness Day alllllll the way. I have a compromise. We’ll make these cookies in December and eat them. And then we’ll make them again in February and eat them again. Brilliant, right? So, let’s talk more about these easy gingerbread cut out cookies that aren’t actually in the shape of gingerbread men. When I started whipping up this dough, I didn’t know if I had a gingerbread man cookie cutter. I assumed I might, but I was wrong. I briefly considered packing up the babe and going out to search for one, but can I just vent for a quick sec about how hard it is to run errands with a babe? In and out of the car seat, up and down in the grocery cart, hunting for the handicap buttons to maneuver the stroller in and out of stores. Oh, and also strangers have been touching my kid in public. 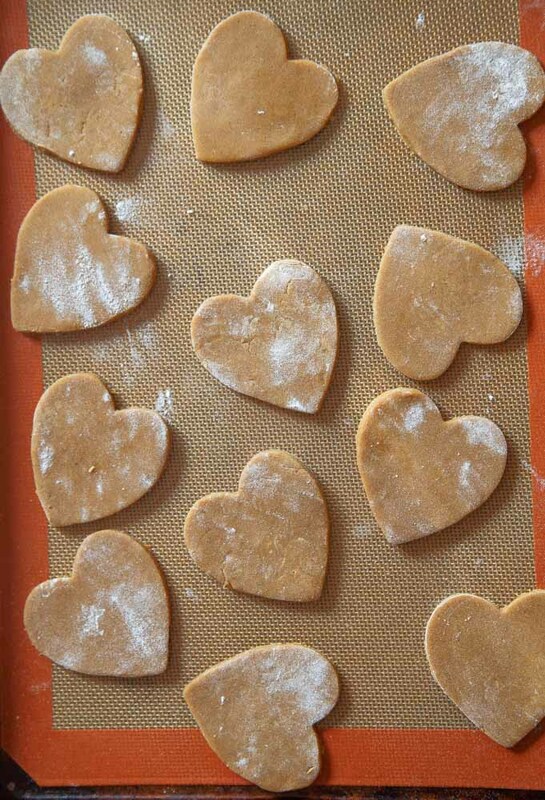 I thought I would avoid the back pain and flu germs, and just use a heart shape cookie cutter. It sounded cute. I thought of the holiday movie ‘Love, Actually’ and thought it would be just fine. It wasn’t until I put the hot pink cranberry glaze on that I realized just how far I’d crossed over into the Valentine’s Day scene. 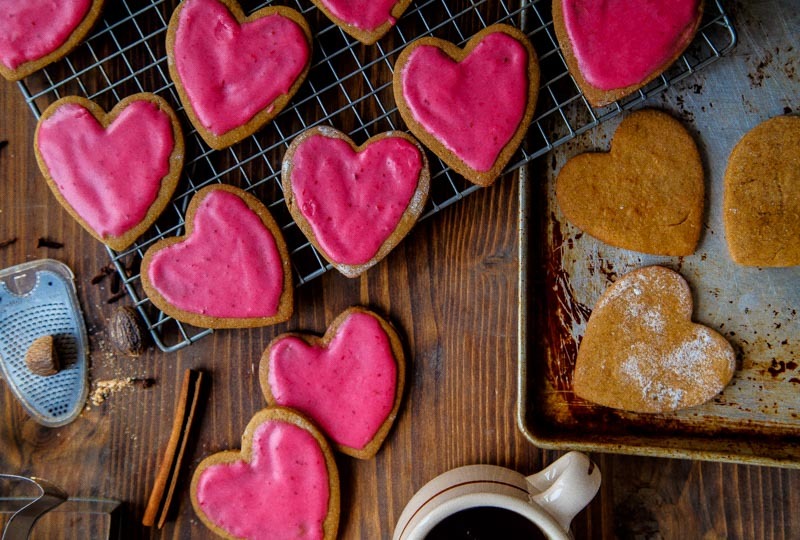 Say it with me: orange spiced gingerbread cut out cookies with cranberry glaze are perfect for Christmas or Valentine’s Day! Year ’round pink cookies for all! 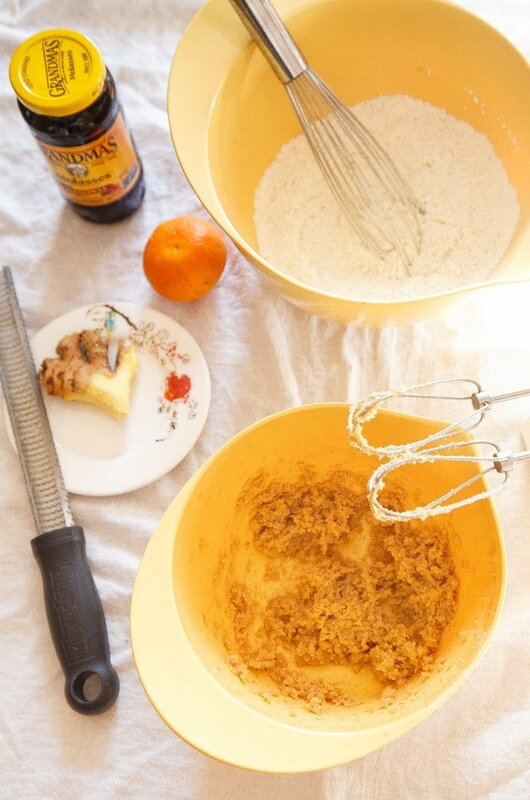 First, whisk together all of the dry ingredients: flour, salt, allspice, nutmeg, ground cloves, and cinnamon. Then, cream your butter and brown sugar. I ran out of dried ginger a few weeks ago (see above comments about venturing out of the house), and decided to use fresh. It was a great choice. 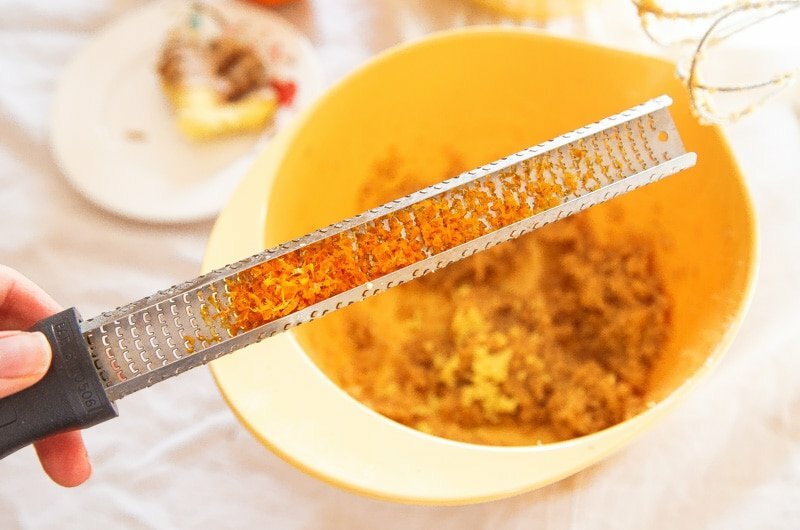 When you’re using the microplane to zest the orange, use it for fresh ginger, too. I’m still using local ginger from my CSA! Add the fresh ginger, orange zest, and egg. Beat until combined. Next, add 1/3 cup of molasses. 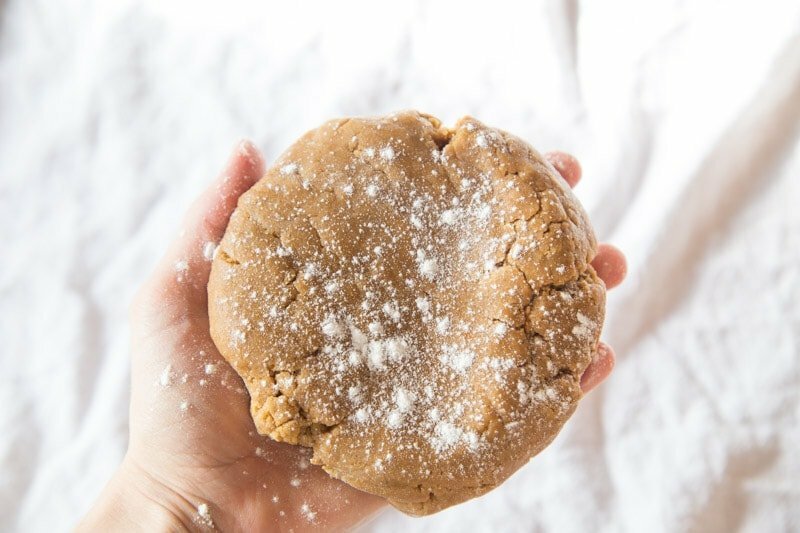 Molasses gives these cookies softness and chewiness. 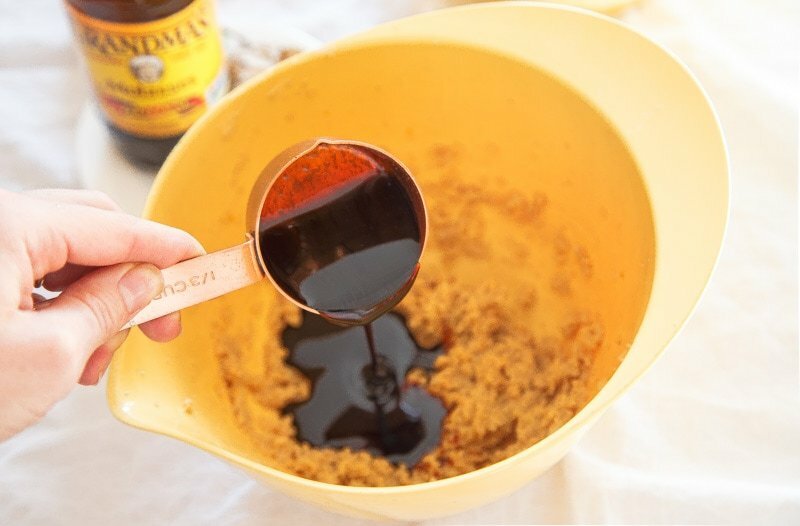 Do not use blackstrap molasses. I repeat: do not use blackstrap molasses. I chilled my dough for about an hour because it seemed soft. My kitchen is very warm thanks to a large gas oven in a very small space. After chilling, flour the board and roll out the cookies. 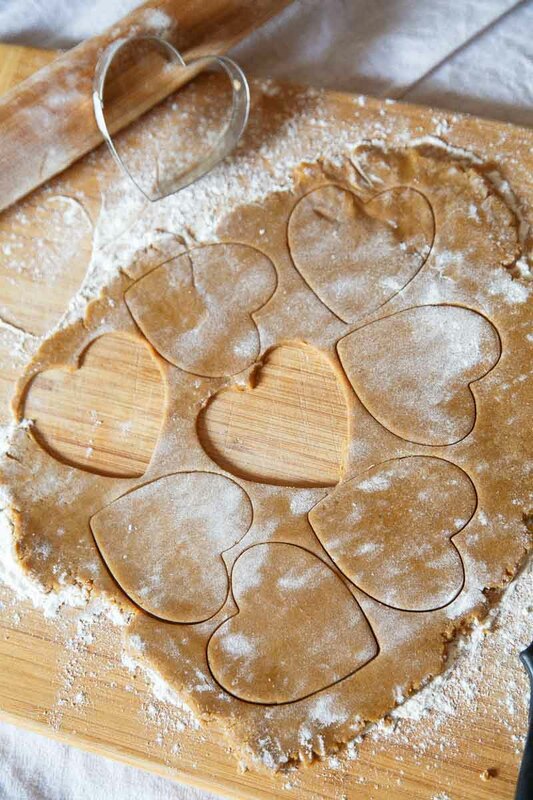 Grab a festive cookie cutter (probably not a heart one), and cut out as many shapes as you can. Gather the scraps and re-roll and cut out more. 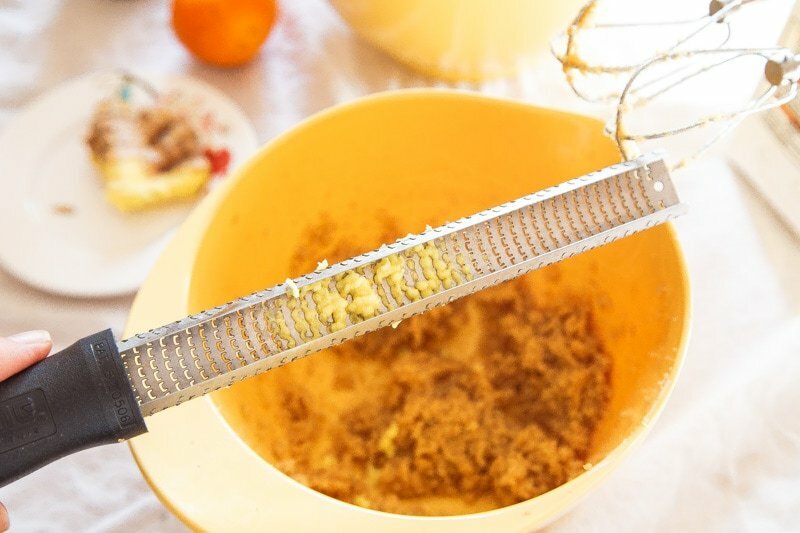 You should get a little less than 2 dozen cookies, depending on the size of your cookie cutter. Use a spatula to carefully move them to a cookie sheet. I like to drive my Mom crazy and place them haphazardly on a silicone baking mat sheet instead of in perfect rows. Bake for 11 minutes for soft cookies, or a few minutes longer for crisp ones. Meanwhile, I went ahead and made another batch of cranberry sauce to use for the frosting. You can use leftover cranberry relish, or even a scoop of canned cranberry sauce. I made a fresh batch using 1 cup of fresh cranberries in a small saucepan with 2 tablespoons water and 1/4 cup of powdered sugar. After cooking until the cranberries burst, I moved the mixture to a small blender (bullet-style works great for this), and pureed. I added another 3 tablespoons of water to get it smooth. Then, I strained it into a bowl, and added another 1 1/4 cup of powdered sugar. This makes a thick, hot pink glaze. I love it so much, I may drizzle it on everything. In a medium bowl, whisk together the flour, salt, allspice, cloves, nutmeg and cinnamon. Next, in a large bowl, beat together the butter and brown sugar until light and fluffy. Next, stir in the ginger and orange zest and beat until combined. Add the egg and molasses, and beat until combined. Add the dry ingredients into the wet in 2 increments, beating between each addition. Gather the dough into a ball, cover in plastic wrap and chill for about an hour. After the hour is up, divide the dough in two pieces, and roll each piece out on a floured surface. I like thick gingerbread cookies, so I left my dough a little more than 1/4" thick. Cut out as many shapes as you can, re-roll dough scraps, and cut out more. Repeat with other half of dough. Place the cookies on a lined baking sheet. Bake the cookies for 11 minutes for soft cookies, or a few minutes longer for crisp ones. Let cookies cool on the baking sheet for a few minutes before moving to a wire rack to cool completely. To make the cranberry icing, add the cranberries, 2 tablespoons of the water, and 1/4 cup of the powdered sugar in the sauce pan. Cook over medium heat until all the berries burst, about 5 minutes. 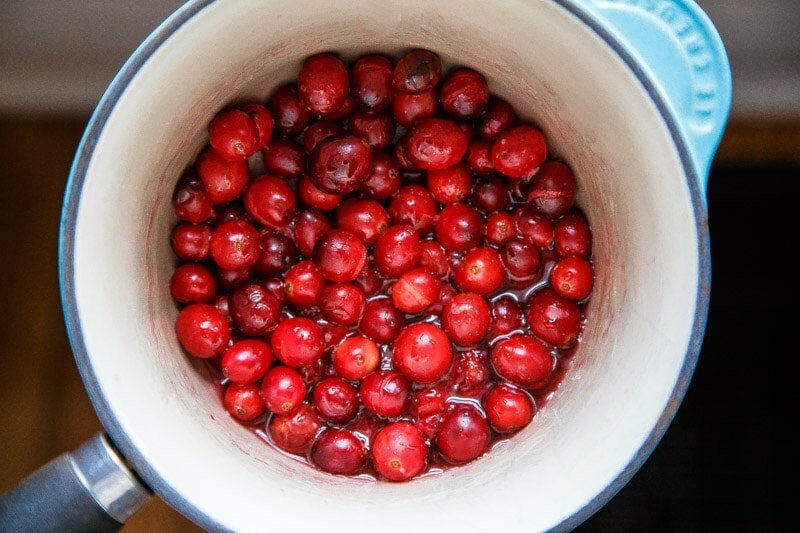 Pour the cranberries along with the remaining 3 tablespoons of water into a blender, and puree. A small bullet-style blender works best. Pour the cranberry puree through a strainer into a medium bowl. Stir in the remaining powdered sugar until a thick, magenta frosting forms. Frost the cookies with the glaze. Let set for a few minutes for glaze to harden. These sound really good! They look amazing to! So what it’s not Valentine’s Day yet! I think I might have just found the cookie I will make for our cookie exchange at work! After the icing dries, does it harden enough to stack the cookies on top of each other? Ok so they might look like they are for v-day but that is 100% ok because I will happily eat them right now :) Plus cranberry glaze – yes! yes! yes! I’ve never made gingerbread cookies and that is crazy because I love them! I saw these on your instagram and I am SO HAPPY you posted this. I LOVE gingerbread, and can’t wait to try them. So pretty! Definitely good for both Christmas and Valentine’s Day. My favorite is that instead of dying the icing you actually flavored with with cranberries. I never think to use flavored glaze! Great recipe! The cranberry glaze looks so cool! And gingerbread cookies with it must taste really good. I think pink is fine at the holidays! I use pale pink Royal icing to decorate some of my star and angel sugar cookies. It’s pretty! This is such a joyful post. I love the presentation, love the sound of the cookies themselves. Christina these look like the perfect cookies! I know myself and sadly I am just not a cookie cutter cookie girl. Do you think this dough would work to roll into a log and chill and slice? Thanks for sharing so many great recipes. i’ve been seeing these all of the facebook and instagram and am in love! Need them for christmas AND valentines day! Wondering why not blackstrap molasses? You had the same comment in your mini gingerbread loaf and I did use blackstrap since that was all I had and I really liked the way it came out. These cookies look so darn cute. I will be making them for sure.One quick question…if I have to use dried ginger, how much would you suggest? Thanks! when I print a recipe, the title of the recipe is not coming out clear, any one else??? How much grated ginger would I use? I don’t have fresh ginger root available where I live. Hi, any other flavour suggestions for the icing. Not really a cranberry fan. Could I just use food colouring and leave it plain?